Tasting wine at last year’s Lost Colony Wine & Culinary Festival. 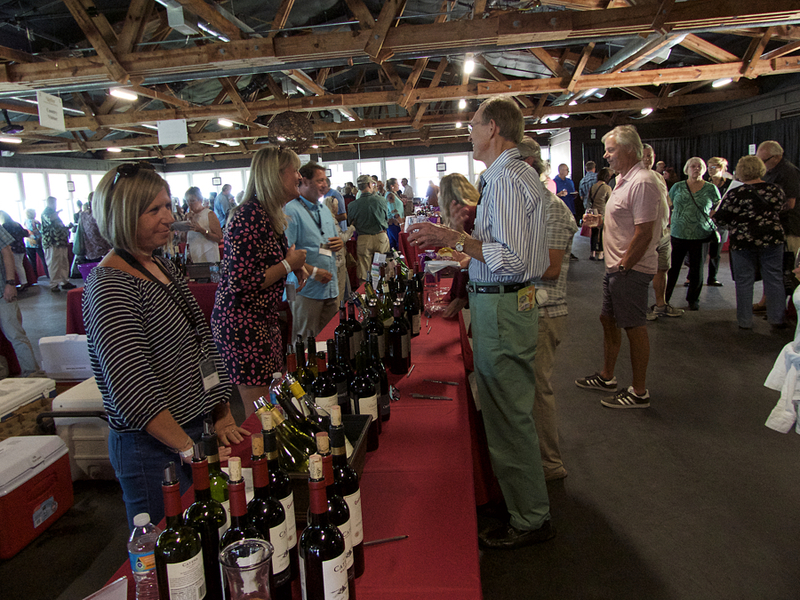 The 2nd Annual Lost Colony Wine & Culinary Festival is here. Last year was great time with over 100 wines available to try and some local microbrews on tap. All of it in one of it at The Lost Colony on the north end of Roanoke Island. It would be hard to imagine a more beautiful setting to sip some wine and some fantastic hors d’oeuvre from some of the finest Outer Banks chefs to go with it. The weekend is actually two events wrapped up into one weekend. Friday night is the Vintner’s Dinner. This year at 108 Budleigh in Manteo, The Lost Colony is bringing in two chef’s from Durham—Josh DeCarolis of Mother & Sons Trattoria and Phil Bey who will be working with Sam McCann of Blue Point in Duck. it should be a very interesting evening. Francis Ford Coppola’s Virginia Dare Winery will be on hand to pair their wines with each course. Saturday is when the fun really gets going with wines from around the world and a couple of local breweries on hand. Elevating the whole experience, there will be tasty treats from some of the best Outer Banks restaurants—Argyle’s, Basnight’s Lone Cedar Café, BlueWater Grill & Raw Bar, Café Lachine…and that’s just a partial list. There will be a silent auction as well and live music. A real treat—look for Joe Mapp to perform. One of the finest guitarists around, Joe very rarely performs in front of large audiences, so be sure to check him out. There will also be a number of seminars on wine offered: Uncovering the Mystery of Sparkling Wine; Wines and Hard Cider from the Russian River Valley; and Taking the Mystery out of the Craft Beer Aisle. For more information or to purchase tickets, check out Lost Colony Wine & Culinary Festival online. There’s lots to do on the Outer Banks this fall. Be sure to book your fall getaway with Joe Lamb, Jr. & Associates.